“Rain” can be produced by gently misting a bird from a spray bottle or by lightly sprinkling him with the spray attachment of a garden hose. A bathroom shower or the spray handle of a kitchen sink also works well. Be careful not to direct the water too forcefully as the upper respiratory tract and sinuses of birds are fairly exposed. “Puddles” can be created by using shallow pans, planter bases – even the kitchen sink. Remember, though, that your bird may insist on using his water bowl as a puddle, regardless of other options you may offer. Sometimes, water alone is not enough. If your bird has become excessively soiled from hand oils, makeup, or just from “getting into stuff,” a mild detergent is necessary. Plain baby shampoo is probably one of the best and simplest to use: Add a tablespoon of baby shampoo to a pint of water. Spray the bird lightly with the solution until the plumage is completely wet. Let the bird sit in a warm place for five minutes or so, then rinse him thoroughly with clear water. This is a good way to restore plumage. There are several commercial products to clean the feathers. All are useful to some degree, but beware of those containing oils or perfumes; some birds perceive them as foreign substances and may start picking at their feathers to remove it. 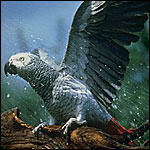 If large amounts of substances like glue, ink or oil contaminate your bird’s plumage, take him to your veterinarian. These conditions mimic the effects of an environmental oil spill, and your bird may need medical attention as well as cleansing.